Barcelona, the capital of Catalunya, was the last city we visited during our summer road trip of 2009 which started in Brussels (it actually started in Vienna, but Brussels was our first true stop) and by the time we reached it, signs of exhaustion were beginning to show more insistently. Still, Barcelona, with the lazy mornings on La Rambla and breakfasts at the abundant food market known as La Boqueria, blazing heat in the afternoon and siestas in the park or at the crowded city beach, and the vibrant night-life, turned out to be a great final stop on our journey. Once again, as for all the previous big cities we have visited, we tried to wrap up our impressions regarding the local English bookstore scene. You can notice that the number of bookstores visited is lower than usual, but trust us, it wasn't for the lack of trying, as we explain further in the text. We were really looking forward to visiting the Altair bookstore in Barcelona. It’s the only specialized travel bookstore we have visited on our summer road trip and many people have praised it. And from the moment we entered the store, we were pretty much sure that we’ll join the numerous ranks of those who praise this bookstore, and we do so gladly, because Altair deserves all the recognition it gets. If you’re planning a trip to a foreign country, this place is perfect to begin your quest and pre-departure research. It’s not only the amount of information that is available for any given region or country that makes this place so special, as many people could argue that you can simply find all that stuff on the web. It’s the absorbing atmosphere of this bookstore that makes every visit a memorable one. This bookstore will make you eager to pack your bag and visit other places even if you had no such thing on your mind upon entering. Two floors of the Altair bookstore are packed with information and perhaps even more importantly also with inspiration. Bonus info: the picture that you can see at the top of each page of this blog has been taken in Altair. The walk to one of the three locations of BCN Books in Barcelona has been quite a long one, but we were rewarded by some unique architectural sights of the city. The BCN bookstore we’ve visited was the one located at Roger de Llúria 118. This two-storey bookstore occupies a very nice building on the street corner and you can peak in through the huge shop windows. The bookstore itself seemed like a nice place to browse and we especially enjoyed the relaxed atmosphere. While we were flipping through the pages of some books on the history of Barcelona, both of the staff members were reading their own books. This doesn't mean that they weren't doing their job. On the contrary, we had a nice informative chat with them once we got there. As for the stock of the bookstore, we liked the section dedicated to Catalunya and Barcelona, the bookstore also has a very decent fiction section and an extensive selection of ELT materials, study books etc. The only section that could use some improvement in our point of view was the non-fiction section. 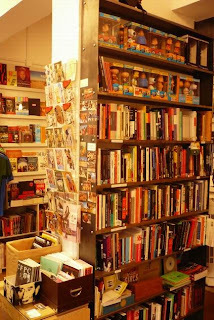 Another bookstore which we have visited in Barcelona was named Laie and although we didn't write a post about it in the Guide, it's definitely worth a mention in this report. This bookstore has several locations in Barcelona and even one in Madrid, but Laie bookstores definitely don't fall into the "usual chain bookstore" category, as all the branches we have seen had a very nice and distinct ambiance. The only reason why we decided against adding Laie to our database is its rather limited stock of English titles, but if you're looking for a good selection of titles in either Spanish or Catalan, then we can only recommend it. After the previous experience we weren't the least surprised to find another bookstore we wanted to visit closed twice. The Watergate Bookshop (NOW CLOSED!!) wasn't originally on our bookstore list - we stumbled upon it accidentally while roaming around Plaça Catalunya and we were really intrigued by its name and very limited working hours. However, we did make it inside after all and we can say that this bookstore offers a very refreshing experience. Its owner has put together a rather eclectic collection of books and items which are quite far from the usual offer you may find at your local bookstore. The interior of the bookstore is also very visually compelling, so although its size is limited, you will surely enjoy browsing around for a while. The Watergate Bookshop is a place which in our point of view manages to keep interested even those who don't consider bookstores one of their favorite places to spend their free time, and that's definitely a good thing. Since this report is the last one from our summer road trip of 2008, we can't resist the temptation to summarize. We've covered our impressions from the anglophone bookstore scene in each of the major cities we visited in a series of reports (in chronological order: Report from Brussels, Report from Paris, Report from Madrid and finally the article you're reading at this very moment - Report from Barcelona). We've visited many bookstores, some of which were really exceptional, we've bought some good books on the way and most importantly, we've had a great time. Your choice of Barcelona bookshops is not bad, but it misses the one that might be the best bookshop in Europe: La Central (Where else would you find in original languages plus translations books ranging from poetry to philosophy to art all in the same awing space? 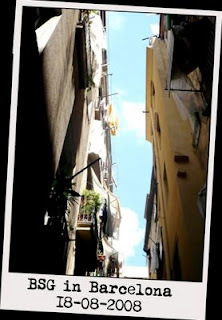 ), in carrer Mallorca (it's got another very large shop in Raval, plus some museum shops, including one in MACBA and another one in CARS in Madrid). 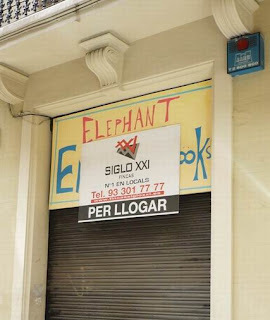 By the way: the sign you show 'for rent' in the es-Elephant bookshop is not in Spanish, but Catalan. As a matter of fact, we did visit one La Central, in the Museo Reina Sofia in Madrid if I'm not mistaken. Don't remember why we didn't include it in the Guide. Nonetheless, feel free to write us some recommendations for the other bookstores and we'll be more than glad to add them! Just send them via mail. I love your idea of providing this guide. How happy I was to find it! Here is a suggestion to help travelers find the stores you recommend: Place a map on each city-page with the sites of the stores on them. I am currently traveling in Barcelona and it is a lot of work to figure out which of recommendations I can get to while I am here. Just a suggestion. Thanks for writing your advice up! La Peixera, what means the fishbowl, is one of the best small bookstores we’ve ever seen in our life. We found it by causality in the district Sarria of Barcelona near the church in a old-fashioned shop gallery from the 70´s (ask for centre commercial de Sarria). They have wonderful illustrated books for children and adults, they have also incredible tendency toys. A real styli and underground highlight!!!!!!! What about Come-In Books on la Calle Balmes? Lots of English books! 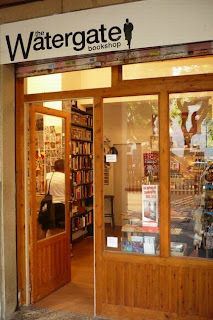 A great bookshop in Barcelona!